Fate had it in for Wallace as his next and last stop was at Andersonville Prison in Georgia. A prison that historians today consider the world’s first modern concentration camp. It was certainly the Civil War’s most notorious. Andersonville started out as an unfinished stockade wall on almost 27 acres of land in a sparsely populated part of Georgia. There was a small creek running through the center and it was relatively close to the railroad for easy access to supplies. The stockade enclosure that was finally built on the land encompassed about 16 1/2 acres and was approximately 1000 feet long and 780 feet wide. 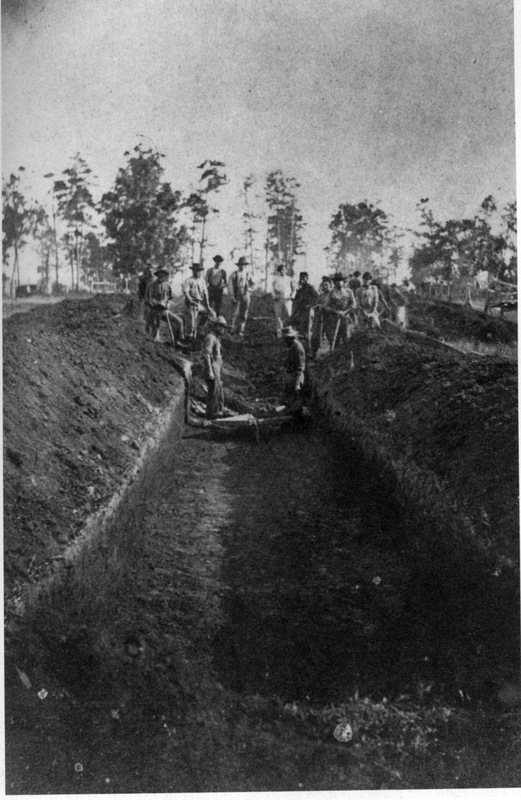 The walls of the stockade were constructed by local farm slaves who cut pine logs on site and set them in a trench about 5 feet deep so close together that you could not see to the outside. The stockade wall included two gates on the west side. After the first wall was constructed, a second wall was set about 19-25 feet inside with the space between the two walls being named No-man’s land, any prisoner crossing into No-man’s land was immediately shot by sentries posted around the stockade. This prison was built to hold 9,000 – 10,000 men. It ended up holding at its peak 33,006. When Wallace arrived at the prison at the end of June, it had been in operation for about 6 months and already there were well over 20,000 men confined in this small space. 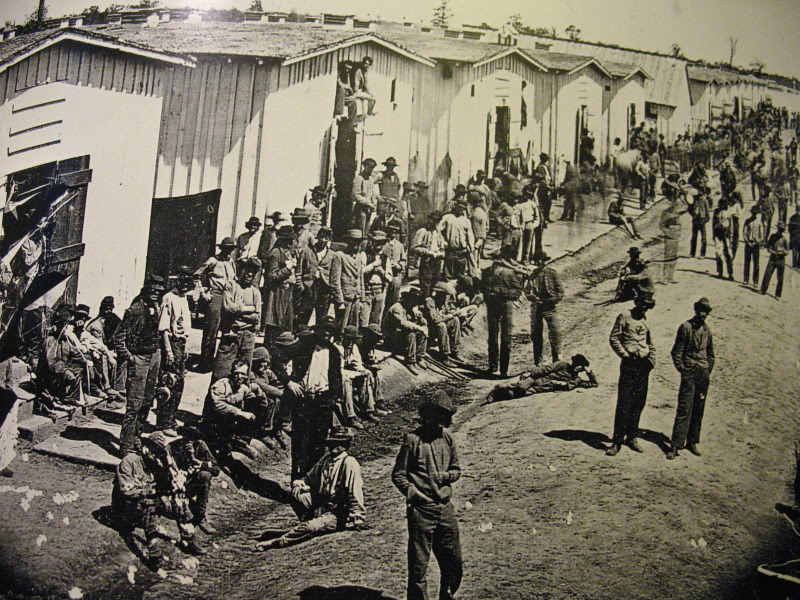 It was at this time that prison administrators decided to expand the walls to the north adding another 10 acres using prisoners and slaves as the laborers. By July 1st the prison was now its final size of just over 26 acres, and by August it was housing just over 33,000 men. It was the largest prison in its time and ours. It was in June that summer when it rained down on the prisoners for over 20 days. Their uniforms rotted to such an extent that they provided little to no cover or fell off completely and some men went around naked. Wallace would have been harassed daily by lice, flies, fleas, and mosquitoes. The ground became so infested with maggots that it look to be alive. Having no adequate facilities for reliving themselves the marshy area around the center of the prison became their latrine, eventually accumulating several inches of excrement, a situation that added more problems to the already horrendous conditions of the camp as it helped to spread disease, and of course rendered the only water source undrinkable. Because the dead were buried outside the walls of the camp, burying the dead became a fiercely fought over opportunity to leave the stifling confines of the camp and get some fresh, insect free, air. The ration wagons, when they arrived, would be swarming with flies, with all the food just dumped into them, cooked or raw, what ever the cook felt like that day. The food was then passed out with buckets that had just scooped it up off the floor. The camp baker would not allow the prisoners to wash the wagons, even though some of them were also used to carry the prison dead. It was bad enough that the prisoners were abused by their captors, they also had to contend with “raiders,” other prisoners who were remembered as thugs not unlike the gangs of New York City. Transferred from other camps, these thugs continued their illicit activities after they were transferred to Andersonville. Their main activity was stripping the ‘fresh fish’ (new prisoners) of any valuables or useful items. Their goal was robbery, but they had no problem adding murder to their resumes. Eventually the abused prisoners had had enough of the raiders and names were named and men were hanged. The abuse stopped, for a while. The men who formed a police force to keep the peace eventually became abusers themselves. General Sherman began to move his army into central Georgia in September of 1864 in what was the start of ‘Sherman’s March’. 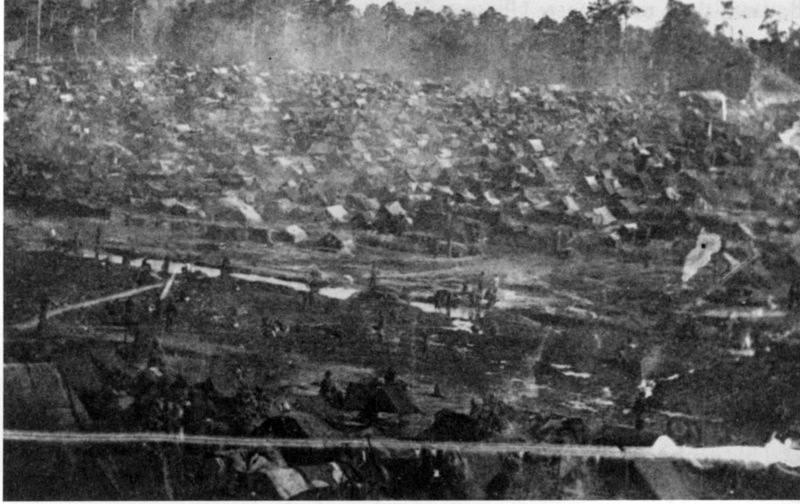 The Confederates, fearful of multitudes of freed Union soldiers rampaging in the southern countryside, evacuated the majority of prisoners from Andersonville to a new camp at Millen and later evacuations to Savannah, Charleston, etc. 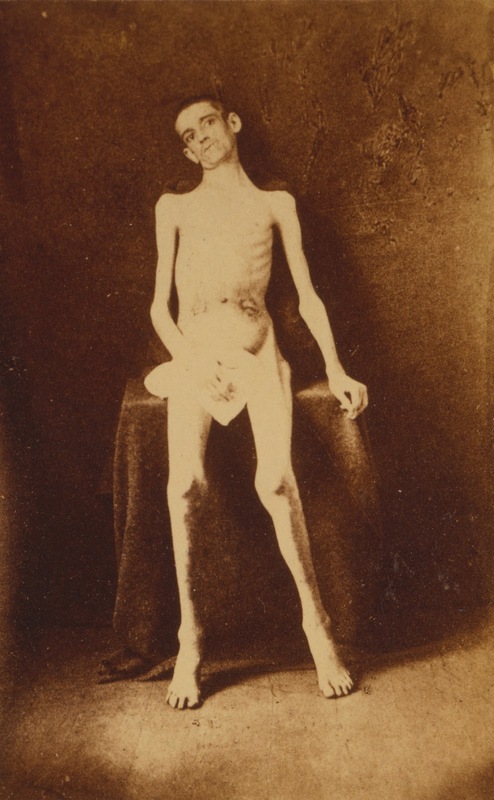 Only those too sick to be moved were left at Andersonville, of which Wallace was one. Sherman never did free any prisoners, although an attempt had been made in July of 1864 – the real goal had been to destroy one of the South’s major supply sources, the railroad, in that area and possibly free some prisoners if the chance presented itself, but the attempt failed, and resulted in more prisoners being added to the already swelled ranks of Andersonville. Freeing prisoners was not a large priority for Sherman, and it is not that he didn’t care, because if he had freed them, the politics of it would have been a boon for Lincoln, instead, he was focused on ending the war, a much better way of getting the prisoners released. For Wallace a rescue might have made a difference. The scurvy he had contracted was finally taking it’s toll. He lay in the ‘hospital’ on his spot on the ground in the open air by the swamp and the stench of the latrine. If he was lucky he had a blanket. He breathed his last foul breath of air sometime on October 26, 1864. His body was probably stripped of any valuables by other inmates, including any gold fillings he might have had. By the time Wallace died there were no coffins or shrouds for the dead so his body would have been place in a shallow ditch, poorly covered with dirt and became food for the vultures. 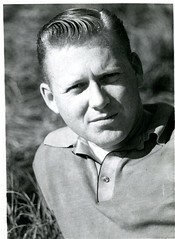 The only item provided at his death was an entry in the burial records of the camp. 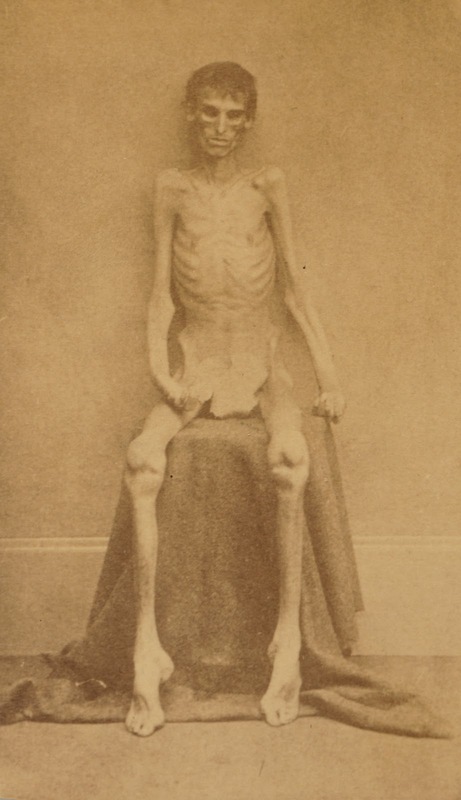 All together the filth, sickness, and starvation rations contributed to just under 13,000 men dying in this prison. History attributes the atrocities at Andersonville on the South’s inadequate rail system, the federal blockade, widespread corruption, greed, fraud, local politics, and administrative incompetence. All of this added together makes Andersonville the first excellent example of bureaucratic collapse due to an administration’s inability to run itself in the modern age. It was this ineptitude that caused the creation of the horror known as Andersonville. The South is not alone in its prison horror stories as the North had comparable administrative problems, but they also had much better resources, so prisoners of war did not suffer the same, but they did suffer. Only Andersonville retains the honor of being the worst. 7 James A. Mowris, A History of the117th Regiment, NY Volunteers (Hartford CT: Case, Lockwood and Company, 1866) 298. [From Ghosts and Shadows of Andersonville, by Robert Scott Davis: p21&22]. 8 A Story of the Trials and Experiences of James Jenning: Late of Co. K 20th Illinois Infantry At Andersonville Prison During the Civil War, by James Jennings. [From Ghosts and Shadows of Andersonville, by Robert Scott Davis: p54]. 9 Scurvy: Early symptoms include malaise, lethargy, loss of appetite, peevishness (ill-tempered), poor weight gain, diarrhea, fever. After 1-3 months patients develop shortness of breath and bone pain. Skin changes with roughness, easy bruising, gum disease, loosening of teeth, poor wound healing, and emotional changes occur, irritability, pain and tenderness of the legs, swelling over the long bones, hemorrhage. Late stage symptoms include, jaundice, generalized edema, oliguria, neuropathy, fever, and convulsions. Left untreated fatal complications include cerebral hemorrhage or hemopericardium. Definition from: http://emedicine.medscape.com/article/125350-clinical. 10 The majority of information regarding prison experience at Andersonville is from Ghosts and Shadows of Andersonville, by Robert Scott Davis, a highly recommended read. The upper right area of the map shows the position of Wallace’s regiment during the battle. For the battle to come the Sharpshooters had been stationed in an open corn field with only small embankments for protection and with no shade. They suffered much from the heat of the sun. The first skirmish with the enemy was a chaotic mess, with bone-weary soldiers, lines not in place, confused orders, and charges made at the wrong time. But the Sharpshooters could be proud of their efforts at the end of it, as a look into the enemy fire pits showed they were filled with the rebel dead. But the battle was not done. It was heading towards evening, and there was little light. The next skirmish commenced. This time the Sharpshooters position placed them alone on the field. The other companies were further off. The first advance the Federals made that day had almost broken the back of the Confederates, but unfortunately, unknown to the Federal generals, the rebels had reinforcements arriving. The next and last battle of the day raged until about 11:00 that night. Firing commenced and at one point the Sharpshooters defending their position heard rebels cry out “We surrender don’t fire.” Some of the Sharpshooters were not sure what to do, others hurried to reload, and still others just held their fire. The rebels were arriving in such numbers that they brazenly began demanding the surrender of the Federal troops. But the Sharpshooters would have none of this. They shoved their rifles in the faces of the rebels and fired. Sheets of flame raged up and down the ridge of dirt between the two forces. They were so close together that clothes caught fire with no regard to philosophies. The flashes from the guns illuminated angry faces screaming obscenities. At this time the Sharpshooters had the advantage, since the rebels had just completed a hard march with a quick run at the end of it. As the enemy continued to came over the edge of the ditch, the Sharpshooters lunged at them with bayonets and clubbed them with empty rifles. The two sides grappled in a vicious hand to hand fight. The Sharpshooters drove their bayonets into some of the rebels, others they forced to surrender. The short but bloody engagement came to an end. The Federals had driven the Rebels back but the fight had been devastating loss to the Sharpshooters as there were now only 100 left to man their exposed position. The worst was yet to come. 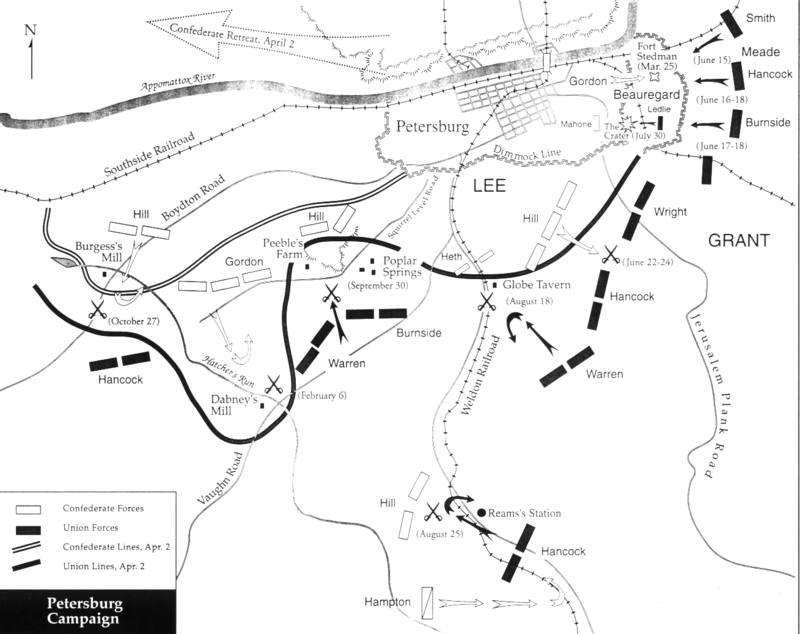 4 While this first battle will be a loss for the Union, eventually the assault on Petersburg will be a win for the Federal Army and will last for several months. 5 Information on the First Michigan Sharpshooters was gleaned from the book These Men Have Seen Hard Service, The First Michigan Sharpshooters in the Civl War, by Raymond J. Herek; Wayne State University Press, Detroit, 1998. 6 Source for battle details of Petersburg assault is from Footnote 4, source 87 – Cutcheon, 20th Michigan, 154; Richard J. Sommers, Richmond Re-deemed: The Siege at Petersburg (Garden City, NY: Doubleday & Co., 1981), 183. On 12 April 1861 the Confederate army decided to commence hostilities on its fellow citizens and fired on Fort Sumter in South Carolina. The Federal Government responded by calling on volunteers to put down this outrageous rebellion, an act that energized four other Southern states into joining in the succession. And so started the bloodiest war to ever occur on our own soil. 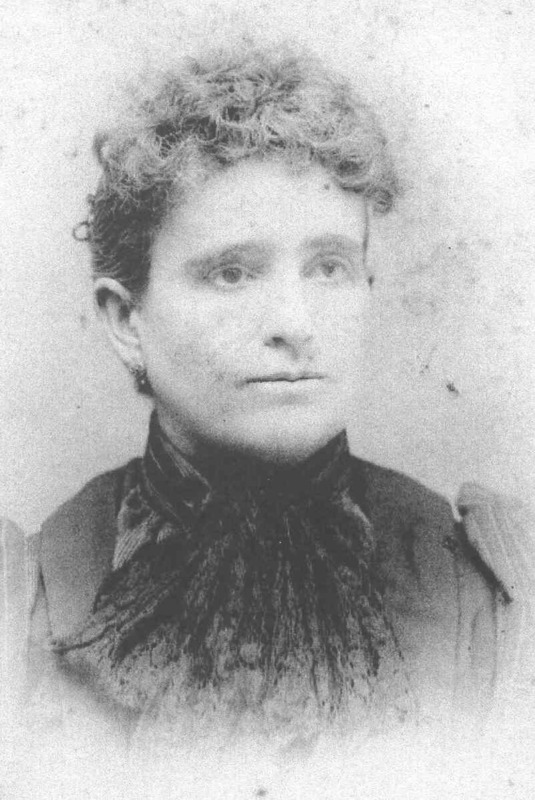 It was about a year and a half later, on 15 August 1862 at St. Joseph, Michigan, that Wallace Rosa (age 34), one of four Rosa brothers who enlisted, made the decision to join in the fight to preserve the Union. The 19th Michigan Infantry, Company I was Wallace’s first foray into enlistment. 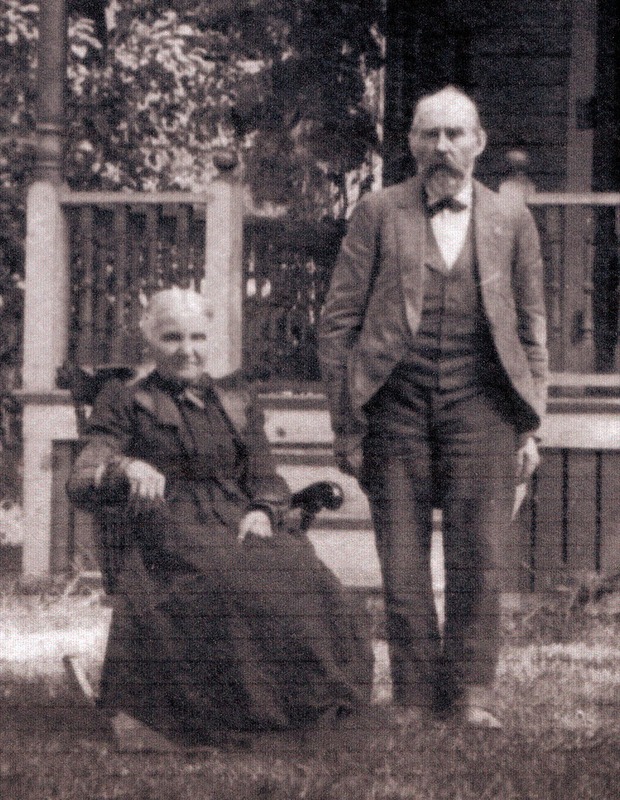 We say first because as his wife Sophia testified in her application for pension “he did not like the company there was so many ol cuntry people.” On 26 September 1862 while the company was at camp in Gravel Pit, Ohio Wallace was noted as ‘deserted’ on his military service record. According to Sophia he had been with the company for a few months (although his military record shows it was just over a month) and then suddenly showed up at home. That same evening soldiers came to take him back to his unit as he was AWOL. He went back to his regiment with out any trouble and was gone for maybe six months, after which he showed up at home again, only staying a few days. Sophia didn’t know whether he was on furlough or not and Wallace didn’t say one way or the other. Wallace did tell her that he wanted to join the same regiment his brothers were in and that he was never going back to Company I. After that conversation he disappeared. 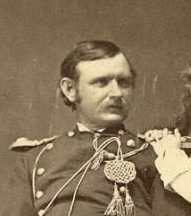 It is apparent that his family was worried about him because sometime in late 1863 to early 1864 his brother Abram, while back in Michigan on sick leave from his own regiment, decided to go searching for Wallace. Abram eventually “found him at Camp Douglas in Illinois answering to the name of Benjamin Freeman.” Wallace had re-enlisted 22 April 1863 in the 1st Regiment Michigan Sharpshooters, Company F which was now stationed there. 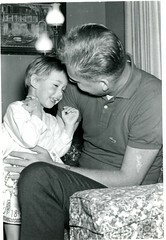 After having finally found his brother, Abram asked him why he had changed his name and was informed by Wallace that “he heard they were after him to take him back to his regement; and thought it might not be well with him.” So he bought himself some hair dye and colored his hair and whiskers then headed to Kalamazoo to re-enlist.3 As he stayed with the regiment, he apparently had no quarrel with this bunch of boys. Shortly after Wallace enlisted in the 1st, the regiment was ordered to pack up its gear and head for Dearborn, Michigan. Life for the regiment was mostly drilling and guarding. The only excitement the regiment saw was their engagement with Morgan’s troops of the infamous Morgan’s Raid, in July of 1863. About a month later on 16 August 1863 the Sharpshooters received orders to vacate the Dearborn arsenal and proceed immediately to Camp Douglas in Chicago. Addressing the companies before they departed Colonel DeLand admonished the men, “It is hoped that the hurtful and disgraceful practice of whiskey drinking will be discontinued, that the disgraceful scene of our former march [those who had been chasing Morgan through Indiana understood his reference] may be avoided.” The soldiers were then loaded into passenger cars on the train and headed to Camp Douglas. Most of the men were disappointed that they still weren’t heading to the front. Their duties at Camp Douglas were once again guard duty, but this time they were going to be guarding rebel prisoners. When they arrived on the 17th there were only 49 prisoners at the camp. Eventually it filled up to hold over 4000, nearly all of whom were Morgan’s men. 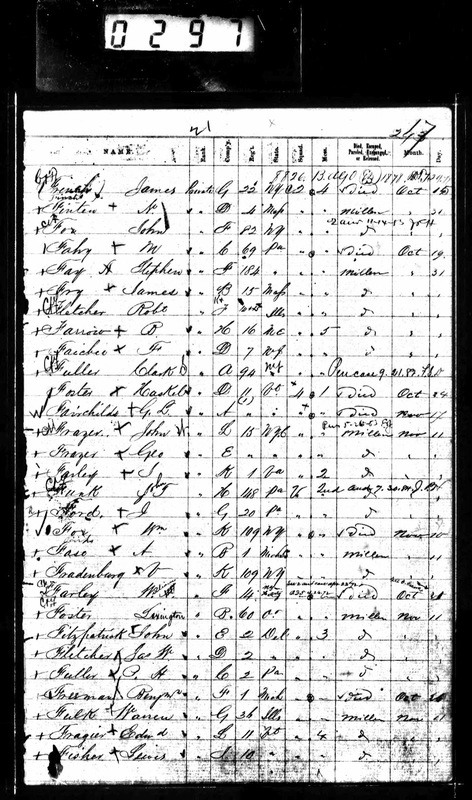 On St. Paddy’s Day, 17 March 1864 long awaited orders finally arrived. 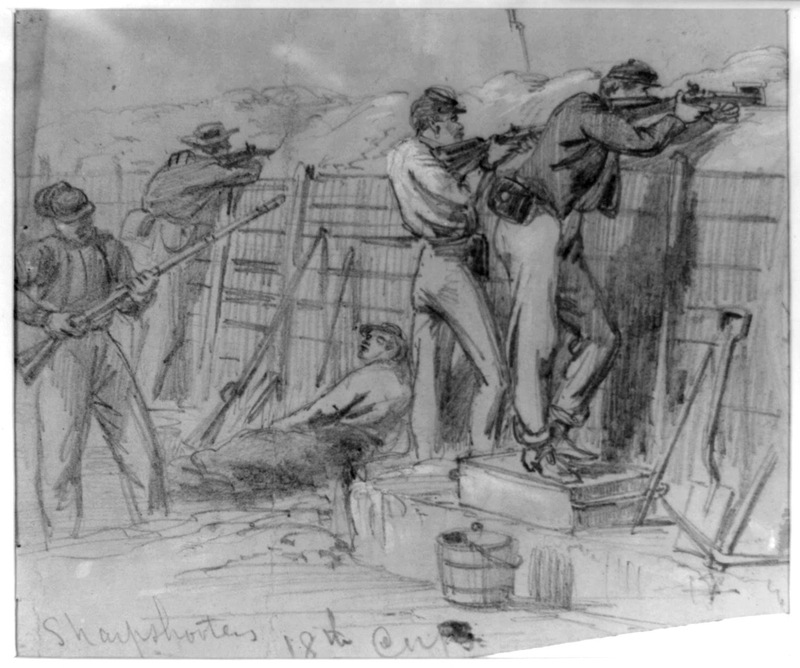 The Sharpshooters were to depart Camp Douglas for the front. None of the men in the regiment had any regrets about leaving after 7 months of boredom, guard duty and drilling. They happily boarded the train to Baltimore, then transferred to the ship that took them to Annapolis. They arrived about 7 in the evening on 21 March. The weather was rainy for a good two weeks after they arrived causing much illness in the camp, but they were now part of the 9th corps. The Sharpshooters received their first order on April 22. They were to head out to join the Army of the Potomac that was 44 miles away. A nasty thunderstorm drenched the men on their march the night of the 24th. 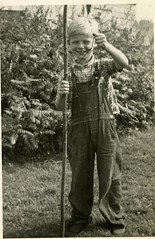 The next morning they walked ten miles over muddy roads and through a creek to Washington, DC. When they arrived they were told to make themselves presentable, for they were going to pass in review in front of the president. Crowds were lined up along the streets, apparently never tired of seeing soldiers marching in review. The President stood on a balcony at the Willard hotel overlooking Pennsylvania Avenue. During the march the men were energized with excitement. Various regiments sang martial tunes, cheered in unison, or quoted poems to the president as they went by. It was a celebration, and the excitement of it all helped the men forget, for a short time, the fatigue of the march the previous few days. 1 The Mexican–American War was an armed conflict between the United States and Mexico from 1846 to 1848 that started when in 1845 the U.S. annexed Texas which Mexico considered part of its territory despite the 1836 Texas Revolution. American forces finally captured Mexico City and forced Mexico to agree to the cession of its northern territories to the U.S.
2 It will be noted that no other country in the world ever acknowledged the Confederacy at any time during its existence. 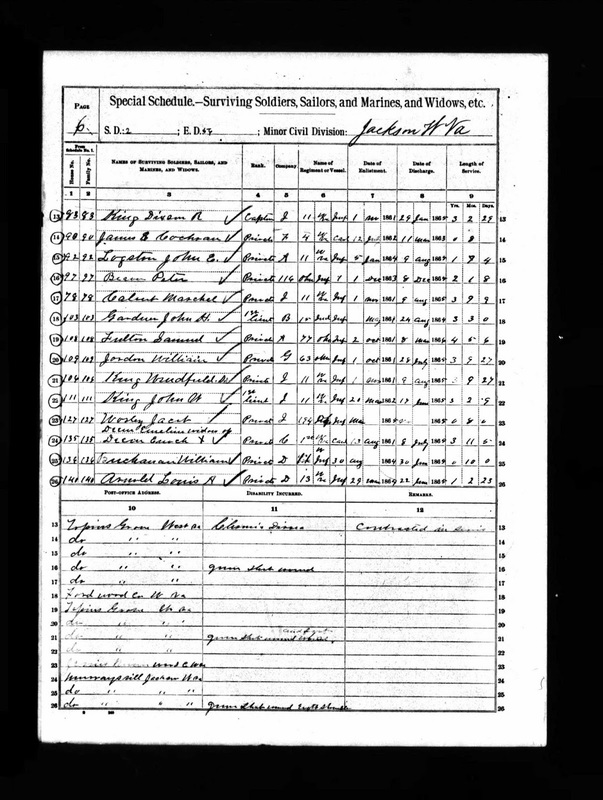 3 Sophia M. Curtis application for pension, widow of Wallace Rosa aka Benjamin Freeman; case number 387817; microfilm Can No. :1181; Bundle No. : 3, NARA, Washington, D.C.